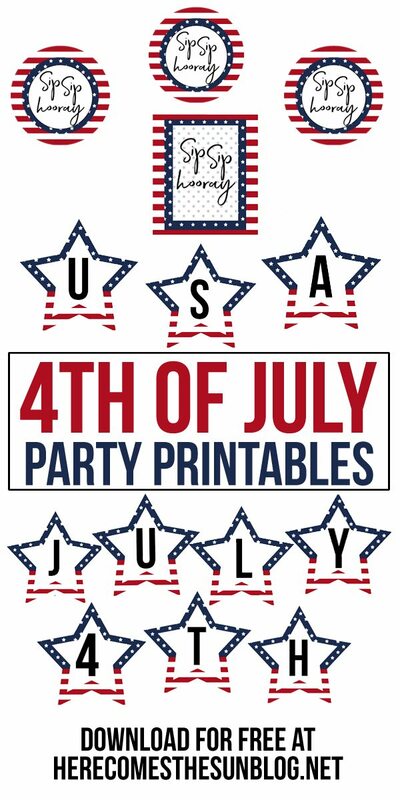 Use these 4th of July party printables to create a fun and festive party atmosphere. 4th of July is so much fun, isn’t it? Every year, we pack up the car and head downtown to watch the fireworks over the river. There is music and food vendors and a big open field for the kids to run and play. I decided to create these 4th of July party printables to make it easy for you to add a bit of style to your 4th of July celebration. Maybe you’re going to head out to watch fireworks like us, maybe you get together for a backyard BBQ, maybe you just stay home and avoid all the chaos. We went through a few years of that when our kids were babies and it just wasn’t worth the trouble to pack everyone in the car and head out. But even if you stay home and don’t join in on the firework festivities, you can still have a little celebration. These July 4th party printables make it super easy. I love showing people that parties don’t have to be a big expensive affair to have fun. I love celebrating the little things and adding a few printables to your celebration can really bring up the WOW factor. This 4th of July party printables set includes two banners, party circles and bottle labels. To create a fun and festive 4th of July party, just hang the banners up wherever you want! There are two banners; one spelling out USA and one spelling out July 4th. The party circles have many uses. You can attach them to sticks and use them as cupcake toppers, string them together to create a banner, attach them to party bags, use them to create napkin rings or as decoration of party hats. There are sooo many uses. They are 2 inch party circles so you can use a 2″ punch to cut them out or you can just use scissors. The bottles labels can be attached to wine bottles, beer bottles, soda cans or water bottles. Adding just a few party printables will take your celebration from blah to fabulous in no time flat. And did I mention that these printables are FREE? As always, these printables are for personal use only. They may not be shared or sold. YOU CAN FIND ALL MY 4TH OF JULY POSTS HERE.